Spicy salads are becoming increasingly popular as people discover that there is more to a salad than lettuce leaves and tomatoes. Thai spicy chicken and mango salad can be made in less than an hour and after eating it you will never think of salads as being boring again. The first thing to do when making your Thai spicy chicken and mango salad is to pour the fish sauce and coconut milk in a large pan and simmer. Next place the four chicken breasts in the pan and gently simmer for approximately 12 minutes. Once you have done this take the pan away from the heat and this will let the chicken breasts cool down in the coconut milk. After the chicken breasts have cooled down remove the chicken from the coconut milk and cut the breasts into small slices. Then place the sliced chicken breasts into a bowl and mix with the spring onions, green chillies, mango, cucumber, mint, celery, and coriander. You then just mix all the ingredients together until the sugar has dissolved. 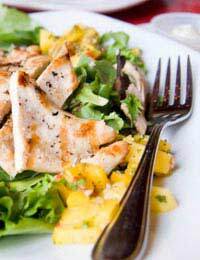 Like most salads, the Thai spicy chicken and mango salad can be adapted to suit a number of tastes. A variation on the above recipe is to use chicken drum sticks, instead of breasts, and to make use of other ingredients such as honey, soy sauce and sesame oil. First pour the sesame oil in a deep frying pan and place chicken legs in the pan to cook. The chicken legs should become brown after approximately 10 minutes. Next you need to add the chicken stock mixture to the pan and after bringing to the boil, simmer and cover the chicken drum sticks for approximately half an hour. This should ensure that the chicken legs are cooked through, but always check this. Mix all the salad ingredients together in a large bowl and then pour the salad dressing over the salad before mixing the contents of the bowl further. Then add the chicken drumsticks to the plates.